I’m so thrilled to finally be able to share this with all of you! For the past 2 months, I’ve been working on a network for fashion and beauty bloggers. May I present: Philly FABB! It’s a new premiere network for fashion and beauty bloggers of the PHL area. Philly FABB was founded with the aims of unifying the fashion and beauty bloggers of the PHL area. 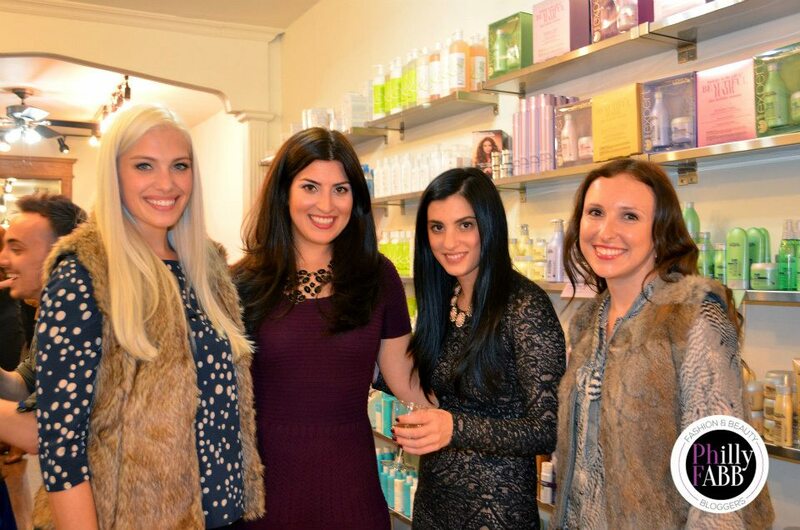 FABB founder: Lauren from The Style Darling, Megan from Meggywood, Philly FABB founder: Jessie from Trend Hungry. 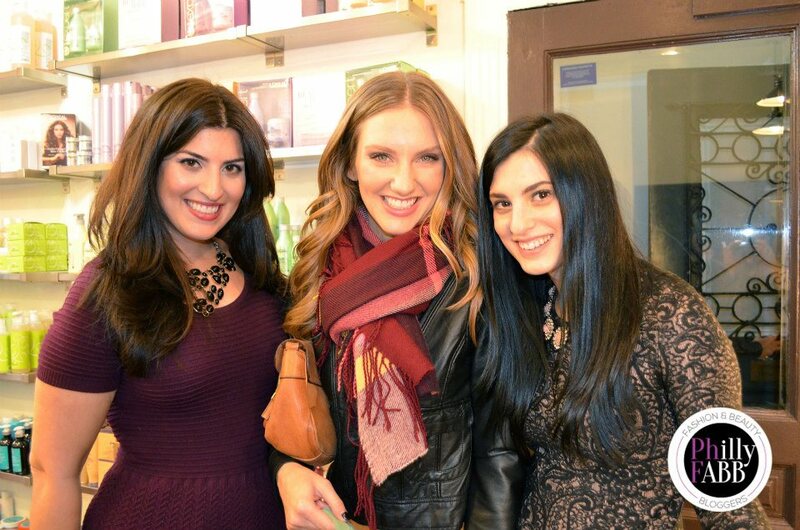 Our first event, The Blogger Blowout Bash, held on Thursday, November 1st, brought the bloggers together for the first time and gave them a chance to network, nosh, and get a little pampering! Enter, André Richard Salon who so graciously hosted The Blogger Blowout Bash. André and his staff were wonderful and treated guests to their signature blowouts and makeup applications. doorBella creating her awesome nail art. DoorBella specializes in magical gel manis. The girls loved the no-dry time and the super cool designs that will last up to 2 weeks! 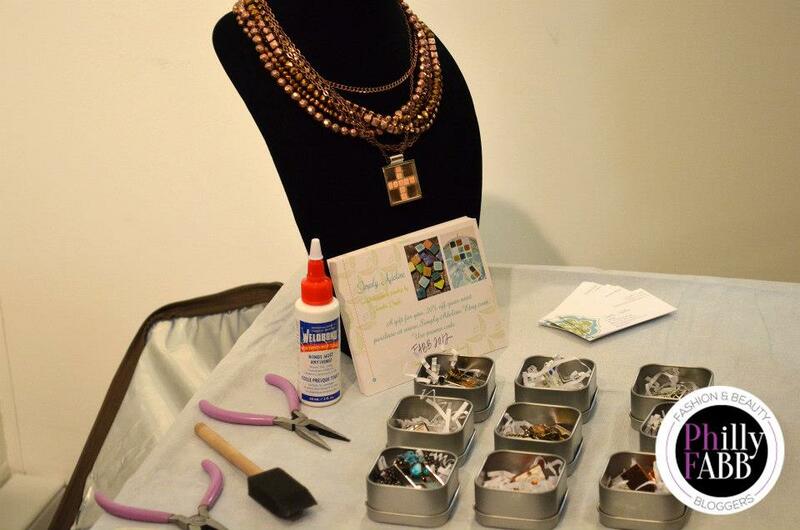 Simply Adeline brought out the blogger’s creative side with custom designed jewelry. Each blogger received a customized Simply Adeline design, so pretty! While the majority of the evening was all about beauty, Philly FABB also promotes brand expansion and development, so we were thrilled to have Richie from Bad Rhino at The Blogger Blowout Bash. The blogger’s had the opportunity to meet with Ritchie for an individual social media branding session. 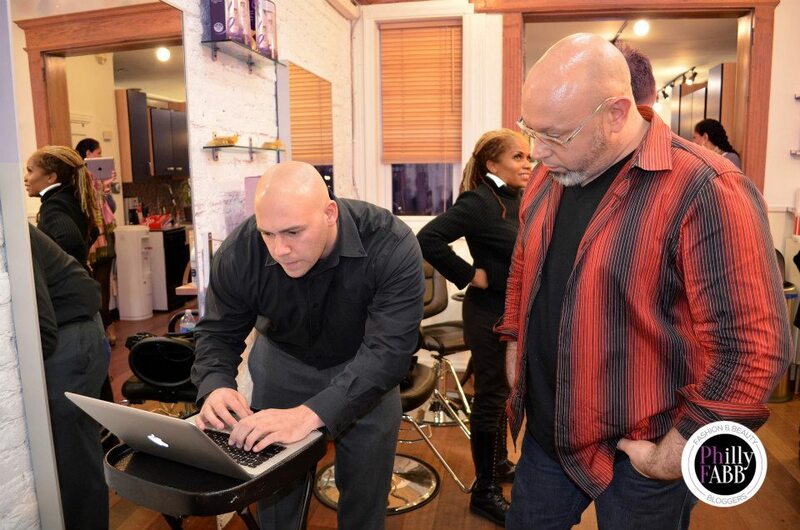 Richie from Bad Rhino + Andre, owner of Andre Richard Salon talking social media. The girls enjoyed an amazing spread from amazing Greek restaurant, Opa. 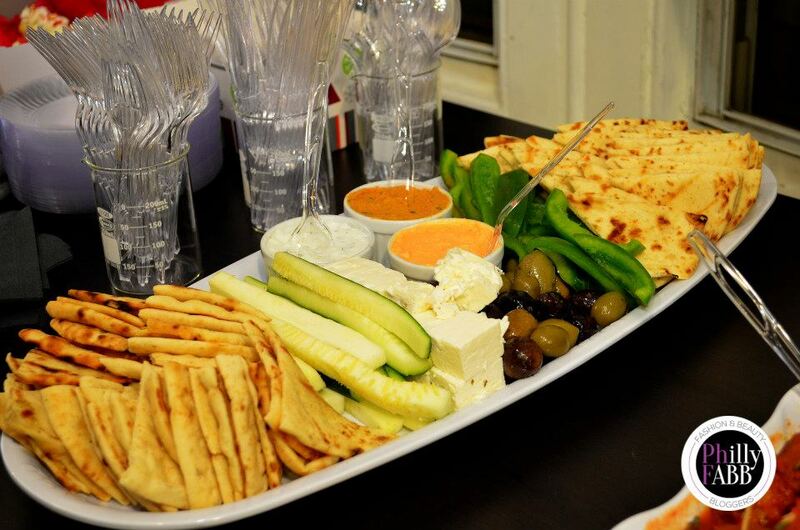 The food was so delicious, next time my friends need a dinner suggestion, Opa will be at the top of my list! Our little feast provided by Opa. 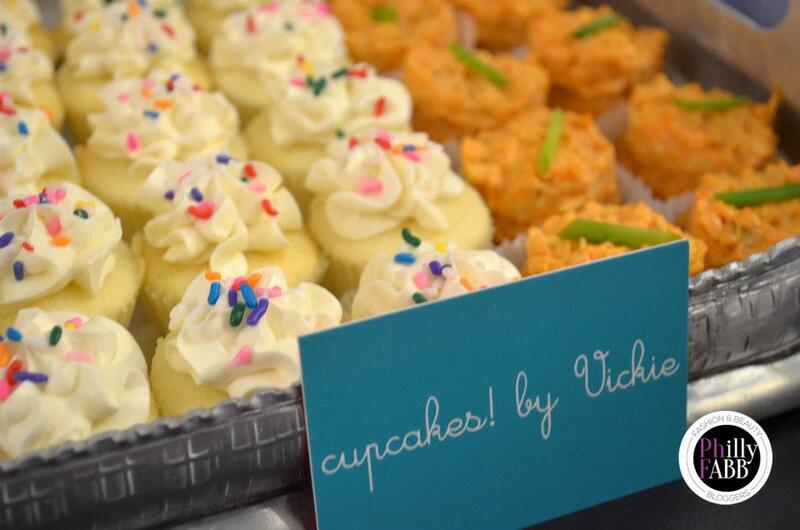 And for that little bit of sweet, Cupcakes by Vickie provided the most delectable mini cupcakes! There were classic vanilla and chocolate, of course. And the new necessary, red velvet, but by far my favorites were the cinnamon and the buffalo chicken. Yes, buffalo chicken. A little cornbread cake topped with a creamy buffalo chicken dip. Oh yum. And don’t worry, the bloggers didn’t leave empty-handed! What kind of host would I be?! Each gift bag, provided by Nich, were full of goodies! Coterie gifted a Butter London nail polish and a gift certificate to use on their amazing beauty site! The bloggers received Dermablend’s SkinPerfector Pigment Correcting Primer (which I am so excited to try and review for you very soon!). Monroe and Main made sure we will remain stylish and warm with their cute black and white checkered scarf. Fine Featherhead provided us with super cute fly ties to give us dent-free and tear-free ponies! The plus-size online retailer and social site, Sonsi, gifted fabulous earrings and matching rhinestone cuff and bottle of H20 to keep us hydrated. The earrings are just the perfect bit of shine, love mine! Midnight Velvet made sure all the bloggers had every girl’s essentials: the perfect evening clutch and a shiny clear lip polish (that tastes like grapefruit! Mmm!). And last but certainly not least, André Richard gave the girls gift boxes of their new product line, ARS. 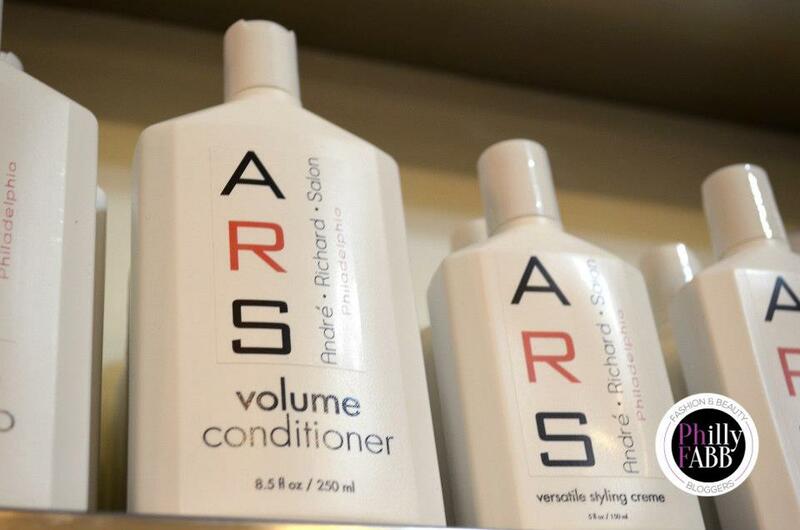 Definite gift bag swag: ARS by Andre Richard Salon. 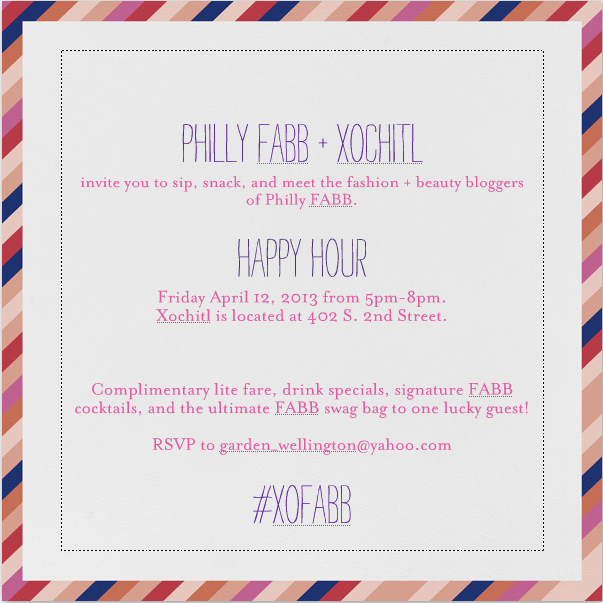 To see all the photos from the Philly FABB’s Blogger Blowout Bash, check out our Facebook page!